Zambia goalkeeper Kennedy Mweene scored a late penalty to rescue a point for the Africa Cup of Nations champions. Mweene sent his spot-kick into the top corner after Ogenyi Onanzi was harshly ruled to have fouled Emmanuel Mayuka. Earlier Nigeria had failed with a penalty when John Obi Mikel hit the post with the score at 0-0. Emmanuel Emenike cut inside his man and slotted in to open the scoring for the Super Eagles but they were denied by a controversial penalty decision. And it was another big slice of fortune for Zambia, who looked well short of the form that shocked the continent last year and took them all the way to the title. Zambia and Nigeria had each won five of the 16 previous their head-to-heads, with six matches drawn, and it soon became obvious that they were going to be evenly matched. A woeful pitch contributed to a lack of precise passing but it could not be blamed entirely as both sides struggled to produce any cohesion or consistency. Zambia were first to threaten, Rainford Kalaba sending a drive just over the angle of the post and bar, and it seemed like the defending champions were in the mood to ignite their bid to retain the title. Herve Renard's side could barely afford another lacklustre display but a display to match their performances of last year never materialised and Nigeria, who also drew their first match against Burkina Faso, fared little better. Yet the Super Eagles were presented with an excellent chance to take the lead when Davies Nkausu tripped Ahmed Musa in the box and the referee rightly pointed to the penalty spot. Up stepped captain Mikel and he demonstrated why he has scored only five goals in his entire career by scuffing his shot, which bounced to safety off the foot of the left upright. Zambia must have considered themselves lucky, as Ethiopia also missed a penalty against them in the first game. However, if the omens were in Chipolopolo's favour, they were unable to capitalise on their good fortune as keeper Vincent Enyeama comfortably pushed away Chisamba Lungu's free-kick and Stopilla Sunzu headed wide from another set-piece. Zambia skipper Chris Katongo - the stand-out player of the last tournament - was also out of sorts, sending one 25-yard effort a long way wide after catching the turf with his foot before he connected with the ball. There was an increased tempo about Nigeria's play after the break and Victor Moses, making his first appearance in the tournament after recovering from a hamstring injury started to look dangerous down the flank, while Emenike had also upped his work-rate. Emenike might have opened the scoring had Musa played him in at the far post rather than selfishly firing in a shot. Pace was Nigeria's main weapon now and Moses blazed down the wing but was unable to deliver an accurate centre. Then came the breakthrough as Mikel slipped a pass into Emenike, who cut inside his man to make space and slotted home into the bottom left corner. Zambia clearly need a change and captain Katongo was one of the men to make way. At last there was some sense of urgency from Zambia and they might have equalised had Rainford Kalaba not hesitated and given the onrushing Enyeama a chance to block his shot. Kalaba was the provider shortly after, cutting the ball back for substitute Collins Mbesuma, whose tame effort was easily saved by Enyeama. 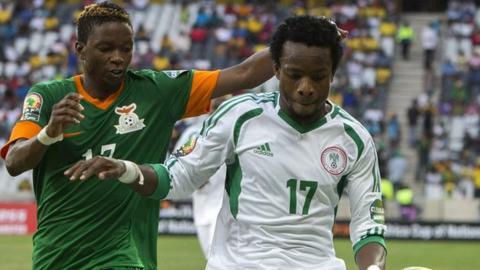 It seemed Zambia were heading for a defeat that would have seriously damaged their hopes of reaching the quarter-finals. But then they were awarded a penalty despite very little contact between Onanzi and Mayuka. And Mweene showed Mikel how to convert with ease as he arrowed his shot into the top corner to deny Nigeria, who are developing a habit of failing to hold on to leads. "I'm happy with the result because of the circumstances. "Never forget we had Nigeria ahead of us. We are still alive and we are still in a good [position] to qualify." "I have no choice but to be happy, but my goal was to get three points. "Zambia were never going to be easy to play against."